Robin's Nest Egg is a beautiful bright sky blue crelly scattered with brown and toffee-colored medium and micro hex glitters. It looks just like a sweet speckled Robin's egg, and the bright, fresh colors are perfect for Spring! Robin's Nest Egg had an excellent formula that applied evenly and with very nice opacity, needing about three coats, as shown here. Some Bunny to Love is a delicate white crelly speckled with round satin matte pink, lavender, mint, and baby blue pastel glitter, as well as tiny yellow and purple matte micro-glitters. It looks just like a soft, plushy Easter bunny, or candy-filled pastel eggs! Some Bunny to Love's formula was also fantastic and applied like Robin's Nest Egg, very smooth and evenly, and needed about 3-4 coats to look mostly opaque. 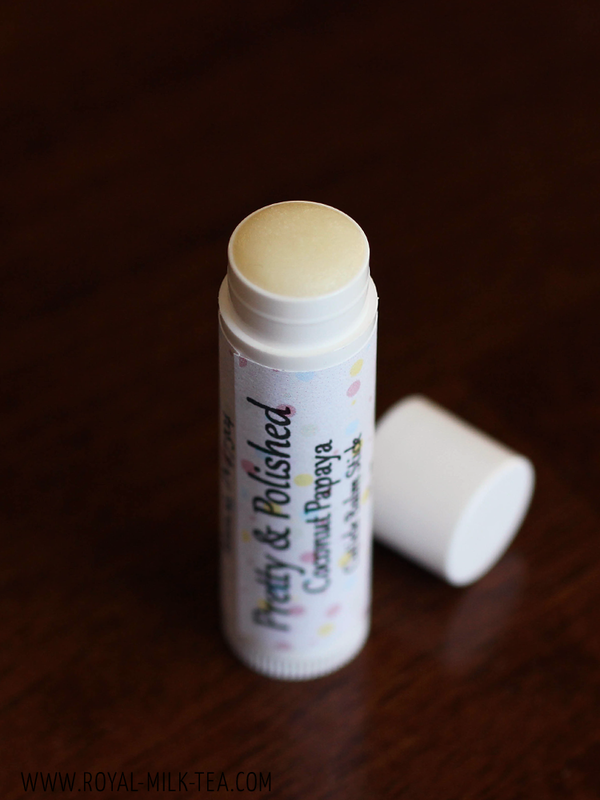 I was also sent one of Pretty & Polished's awesome cuticle balm sticks to try, and it's totally fantas-stick! (Eh?! You see what I did there?) The Coconut Papaya cuticle balm has a fruity and tropical fragrance that's very pleasant without being too overwhelming. I've been using it for about a week now and I love how soft and moisturized it makes my cuticles/hands look and feel! The tube packaging makes it super convenient to toss in your purse and use throughout the day as needed. I was very pleased with how quickly the balm absorbs into my skin, leaving it soft and nourished without feeling greasy. 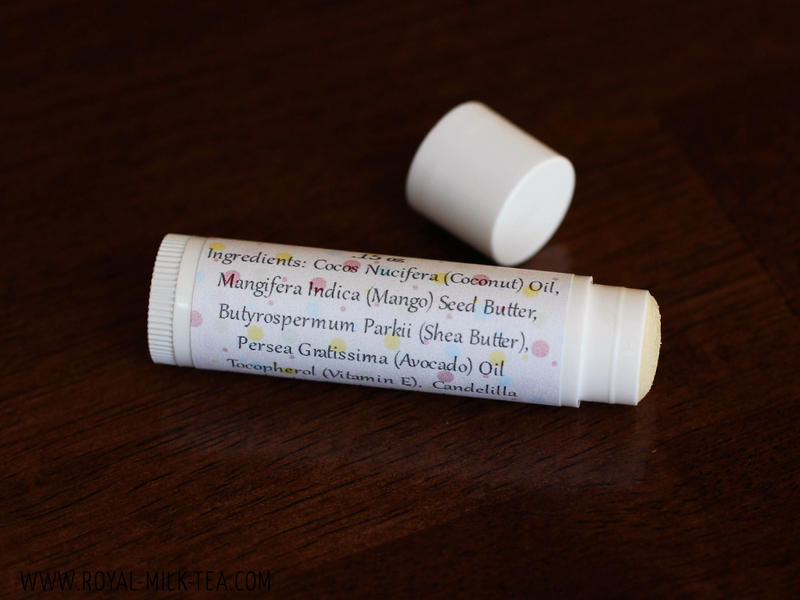 Pretty & Polished uses all-natural ingredients in her balm sticks, which I absolutely love, and which means that the balm can feel gritty at first until it warms up and melts into the skin. I found that the best way for me to apply the balm was to rub it in the palm of my hand, warm it up by rubbing my hands together, and then to continue rubbing it into my hands and cuticles. 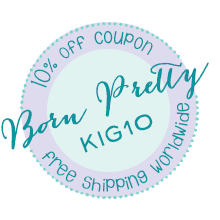 Pretty & Polished offers a variety of hand and cuticle care in a great range of yummy scents. The "Almond Biscotti" is definitely one that I'd like to try next! 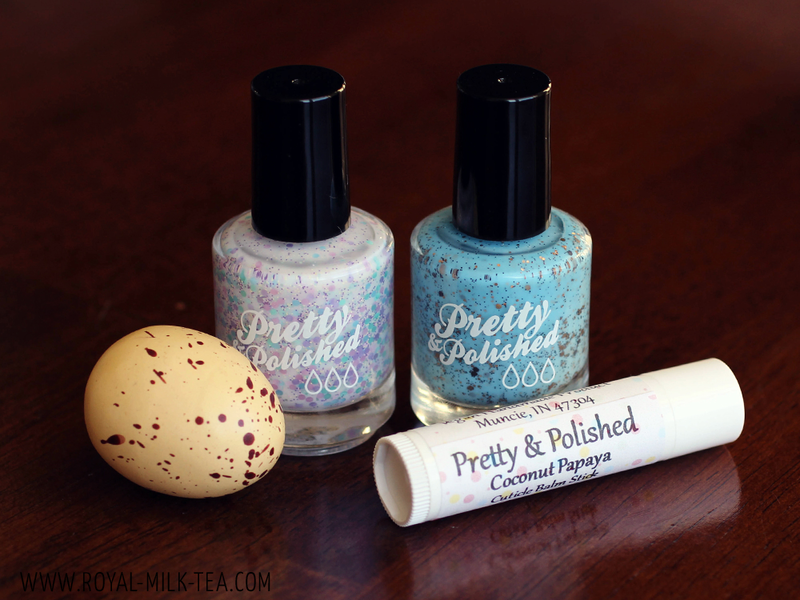 This pastel duo is just perfect for an egg hunt or a picnic on a lovely Spring day! And I'd definitely recommend the cuticle balm sticks to keep hands looking beautiful, too. Products were sent for my honest review. 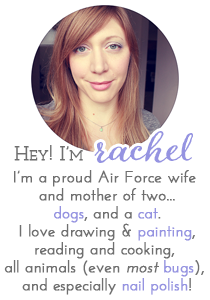 Please read my disclosure for more information. These are both cute polishes! I'm especially drawn to Some Bunny To Love because I just love polishes that are soft and girly. The pastel circle glitter is so pretty to look at. Oh my goodness, these swatches are just gorgeous!! 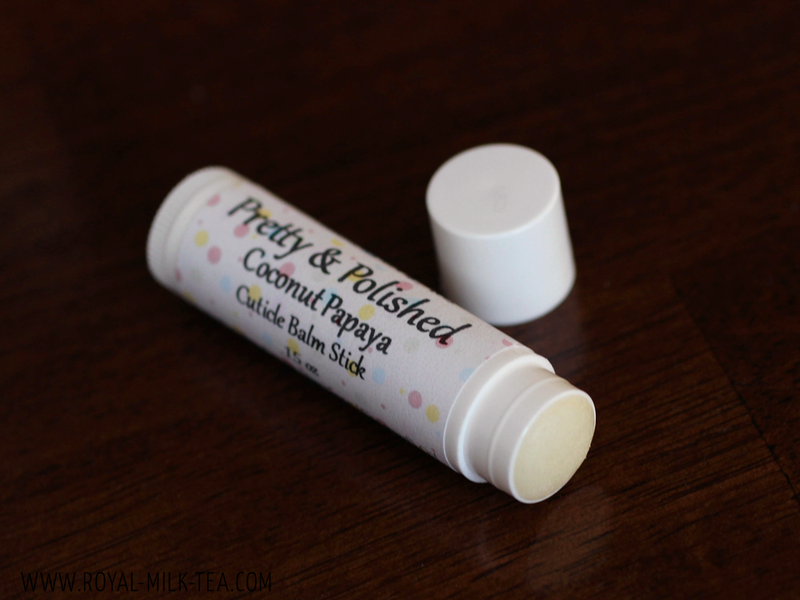 I love the coconut papaya cuticle balm stick. I keep it in my purse and use it all the time! The scent makes me feel like I'm at the beach! What a perfect duo for Easter! There pretty.